Returns the text between the two subtexts in the third text. Returns the desired last characters of the text. Returns the desired first characters of the text. Returns the text, but with all spaces removed. Determines whether the first text exists in the second text or not. Determines whether the text is all full of spaces or not. Determines whether the text contains only alphabets or not. Determines whether the text contains only numbers or not. Determines whether the text contains all uppercased alphabets or not. Determines whether the text contains all lowercased alphabets or not. returns the first text , but with second text removed from it (if it exists). Returns the text with all letters uppercased. Returns the text with all letters lowercased. returns the ordinal value of the single character. Since there are different encoding standards, a character can have different ordinal value on different devices. Ex. Character 'A' has ordinal value 65 on most Encoding Schemes. 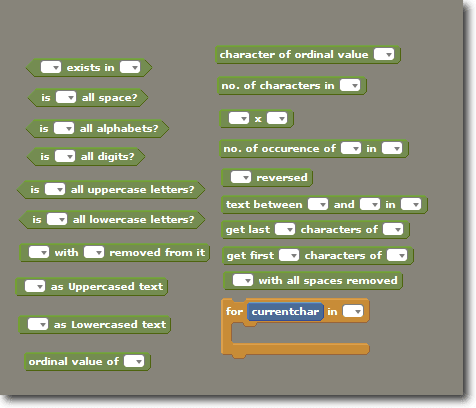 returns the character corresponding to the ordinal value according to the current encoding scheme. returns the text , replicated by the desired number. Ex. [GAD]x will give GADGADGAD. Returns how many times the first text appears in the second. Loops through the each character of the text.